For those excited by science, who enjoy working with animals and would like to find out more about what it takes to become a veterinarian or veterinary technician, this program is just the ticket! Aspiring veterinary healthcare professionals will experience first-hand the fascinating world of veterinary medicine. 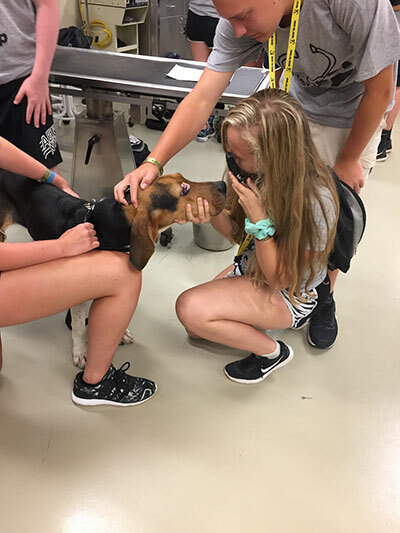 The only camp of its kind in Indiana, Boiler Vet Camp gives want-to-be veterinarians or veterinary technicians the chance to live out their dreams. This camp is designed for students who are interested in becoming veterinary healthcare professionals and provides a preview into the real and vast fields of veterinary medicine. Students who attended a previous camp can not repeat the same camp. Through presentations, demonstrations, laboratories, visits and in-depth, hands-on activities, students will discover what modern veterinary medicine is all about. Students will gain personal experience of what it is like to attend vet school and what it takes to become a veterinarian or veterinary technician through this seven day on-campus experience at one of the premier veterinary schools in the country. Students entering 8th and 9th grades are eligible to attend Jr. Camp and students entering the 10th, 11th, or 12th grades are eligible to attend the Sr. Camp. The minimum age required to attend Vet Camp is 12 years of age. The application is now closed and will reopen in September 2019. Please check back then! The seven-day Senior Camp cost is $1500 and it is open to students entering 10th, 11th, 12th grades in Fall 2019 - Camp is scheduled for June 16 - 22, 2019. Learn more. The seven-day Junior Camp cost $950 and it is open to students entering 8th - 9th grades in Fall 2019 - Camp is currently scheduled for June 9 - 15, 2019. Learn more. Many partnering organizations have joined with the College of Veterinary Medicine to provide financial assistance for both camps. PARTIAL scholarships are available. Camp fees are all-inclusive for the hands-on in-residence camps.